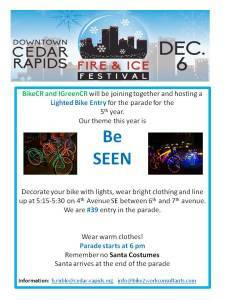 BikeCR has a bicycle entry in the Fire and Ice Parade this Saturday. LCTA is a member of BikeCR and you are invited to participate. Put lights on your bike, wear warm clothes and join in. We are entry 39. Meet at 5:15-5:30, 4th Ave SE between 6th and 7th St.
LCTA has installed counters at 12 locations along many trails in Linn County. Each counter consists of two posts located on opposite sides of the trail painted either blue, brown or white. We record the data from the trail counters, reduce the counts to daily and average weekly usage and publish the data on the LCTA web. See linncountytrails.org/maps/trail-usage/. We rely on trail users like you to read the counters and send us the counts. Simply record date, time, location, and count (6 digit number at the top of one of the posts) and send it to [email protected]. We are now putting names of each trail counter location on the counter posts along with the post location number. You can either specify the location with either the name or number. We have prepared a business card with the reporting information and the locations of each of the 12 counters. You can pick up a business card at the LCTA booth at the Cedar Rapids or Marion Farmers Markets. 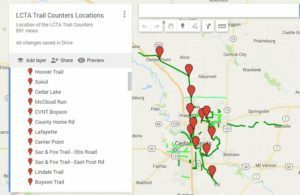 If you have a smart phone, you can send the count while on the trail by entering the data on the LCTA webpage: linncountytrails.org/maps/trail-usage/count/. Note: Two trail users have recently made the Grand Tour of all 12 counters in one day and sent us the counts (presumably on a bicycle). Are you up to the challenge? It may be easier for you to collect all counts into one email. Iowa Department of Transportation (IDOT) is holding meetings to request public input on the development of a new statewide plan for bicycle and pedestrian transportation. Iowa is behind many neighboring states such as Minnesota, Wisconsin, and Missouri that have state sponsored trails that extend beyond the urban counties. The only reason that the Cedar Valley Nature Trail exists today is that Linn and Blackhawk Counties stepped up and assumed responsibility for the trail in the rural counties of Benton and Buchanan Counties. It is important that LCTA trail supporters have a strong presence at this meeting. Please plan on attending! Walking and biking are proven ways to improve the quality of life for all of us, providing healthy alternatives for people to get where they need to go. Many Iowans have embraced bicycling and walking for both recreation and daily transportation. Iowa’s extensive trails system continues to evolve and recreational events such as Iowa’s RAGBRAI event each July continues to grow in popularity. Moving forward, the Iowa DOT has made a commitment to our customers to develop a Bicycle and Pedestrian Long-Range Plan to expand opportunities and further improve conditions for bicycling and walking across the state. Upon its completion, this plan will serve as the primary guide for statewide decision-making regarding bicycle and pedestrian programs and facilities, including sidewalks, trails, bike lanes, paved shoulders, and other trail elements. It will also help achieve a better level of statewide coordination and continuity for all levels of bicycle and pedestrian mobility through regional, county, and city plans and programs. It is a primary goal of this project to get customer input during the development of the plan through public meetings, social media, and email. The initial round of public meetings will be held in November 2013. Visit the “Public Involvement” page to find out how you can get involved. It is a primary goal of this project to engage citizens during the development of the plan. The following public meetings have been scheduled. The Cedar Rapids segment of the Lindale Trail is now paved. The Trail is open! This trail is unique in the Metro area in that it includes 3 ft gravel paths on either side of the 10 ft asphalt pavement. We hope this accommodates both runners and bikers. Bike traffic significantly increases when a trail is paved but runners strongly prefer a gravel path. We would like to know if this should be a design standard for future trail construction when sufficient width allows. Linn County Trails Association (LCTA) initiated the Lindale Trail project 3 years ago when Tom Treharne, Marion Planning & Development Director, suggested that we adopt the project to continue the trail in Marion that extended to the Marion City Limit on an abandoned railroad right-of-way. LCTA has contributed over $55,000 to the development, including a $15,000 contribution from Rockwell Collins. 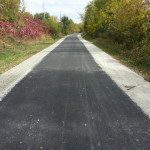 The City of Cedar Rapids has contributed the crushed limestone, the crews and equipment to grade and pave the trail and $16,000 towards the cost of asphalt. THIS WAS A TEAM EFFORT AND WOULD NOT HAVE HAPPENED IF ALL PARTIES HAD NOT CONTRIBUTED! Projects like this are funded by the LCTA supporters that make annual contributions to LCTA for trail development in the Linn County Area. Please add your support. TOGETHER WE CAN MAKE TRAILS HAPPEN! Lindale Trail is located north of Blairs Ferry Rd extending east from C Ave NE (in front of Walgreens).